I will be flying off to Sandakan in less than 24 hours to do my month long elective attachment with the boys in Duchess of Kent Hospital, department of Internal Medicine. I am feeling quite excited as I've never been to that part of the world yet. 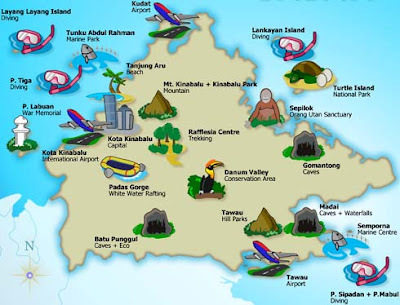 4 of us will be doing some travelling around Borneo as well so do wait up for pictures of proboscis monkeys, sea turtles and orang utans. The SUN, SEA and SICK PEOPLE. The 3S of a successful elective posting. SANDAKAN here I come! Physical examination revealed decreased chest expansion over the upper chest. Percussion over the chest revealed dullness over the right upper lobe with apical crepitation on auscultation. Several enlarged cervical lymph nodes were present as well. 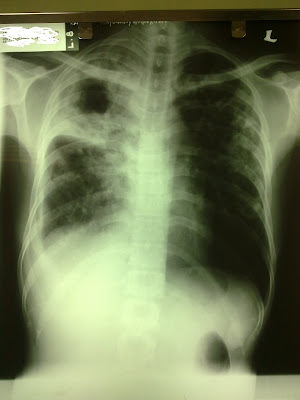 Chest X-Ray of another patient with active PTB. Note the cavitation. consolidation and deviated trachea(mediastinum) due to scarring. 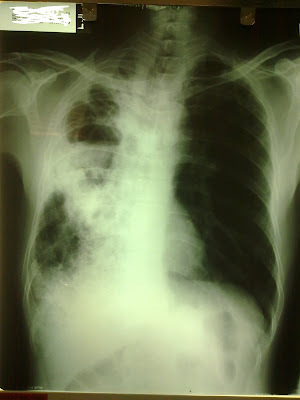 Yes, you are right, he was having active pulmonary tuberculosis. Isoniazid-Peripheral neuropathy, hepatitis, pyridoxine deficiency, drug induced lupus! Well, since it’s the end of year holidays now and I barely have anything intellectually stimulating to do, I decided to help him with some information gathering. Below are some interesting video clips that I have come across. From designing a device that could prevent breaking the cold chain of vaccines to diagnosing malaria infection by just looking into your eyes/nail beds, if only more geeks would put their skills to use like this, the bright future that we long for is definitely not far away. Who needs to learn how to do a BFMP(Blood Film for Malaria parasite)? Diagnosing malaria is going to be a no brainer! And since this gadget could specifically exterminate the mosquitoes other than some other harmless insects with wings, I believe Dengue fever/DSS all can be put to a stop. Next, how about using an I pad during a surgery to view high resolution CT/MRI scans? A team of surgeons in Kobe University Japan actually put this device into good use. The touch screen seems to be working fine although it is covered by a sheath of sterile plastic film and the surgeon has donned on his gloves. Uploaded by jdx459. - See video of the biggest web video personalities. Not a big fan of these products(I-phone/I-Pad) tho, just another over-rated, highly glorified mobile phones around. One of my housemates once told me:" The sole reason of me getting an I-phone 4 is just to impress the chicks, nothing else". Anyhow, we all have to admit that advancement in the field of medical technology has certainly improved our quality of life and revolutionized how medicine is being practiced today.